Image: Welbeck Abbey. West front. 19th century photo. 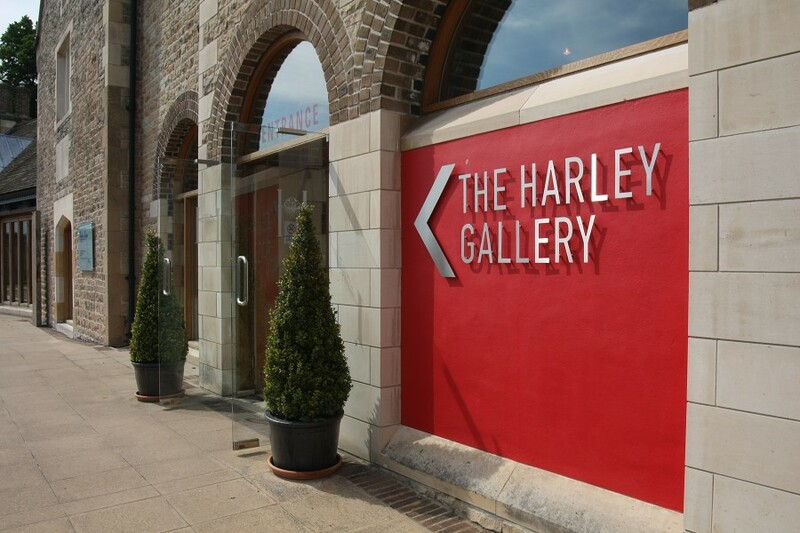 Picture: Harley Gallery. 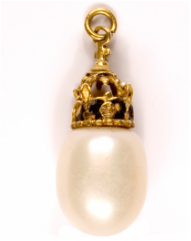 Pearl drop earring with gold mount, worn by Charles I at his execution in 1649. England, c.1616. Image: Harley Gallery. Welbeck Abbey is a wonderful estate in Nottinghamshire, filled with promise, secrets and history. Its estate contains a huge country house, lived in by the Cavendish-Bentinck family since the early 17th century and still today. It is a private home and has been for a very long time. The house is partly open to the public for only one month a year, August, when visitors can be taken around the State Rooms. Tickets are highly sought after and quickly sell out. Welbeck Abbey is also the home of the fantastic Portland Collection, brought together by the family over the course of 400 years. It is a huge collection of tapestries, sculpture, furniture, books and art of rare and great quality. I joined one of the tours of the Welbeck Abbey State Rooms on a rainy Tuesday morning and our group was wonderfully shown around by Ned, a young man with a knack for storytelling. He kept us all interested and entertained while whisking us through parts of the enormous house. 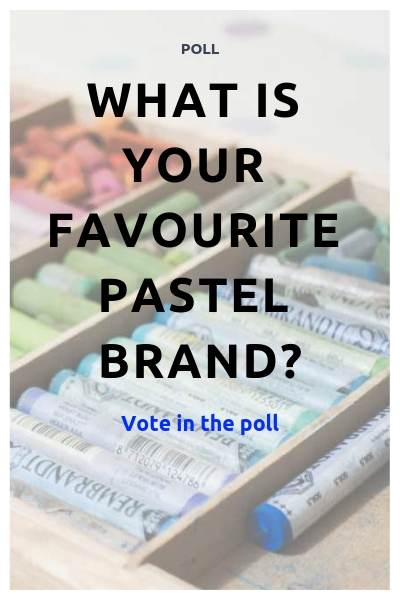 We spotted kings and queens, old masters, gorgeous tapestries and Gothic ceilings, but whomever had done a little bit of homework sensed there must be more. Much more. Everything about Welbeck sniffs of more. 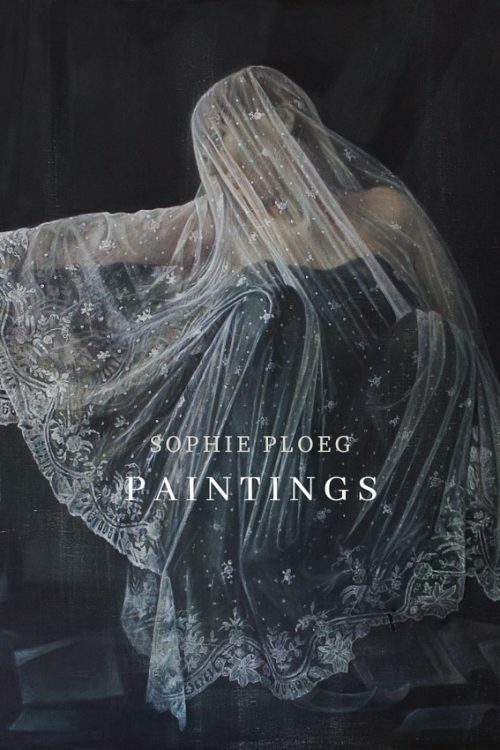 It sniffs of its glorious past, its stupendous art collection, its fantastical architectural history, its idiosyncratic past owners, its monastic beginnings, its obsession with collecting, and its love of horses. 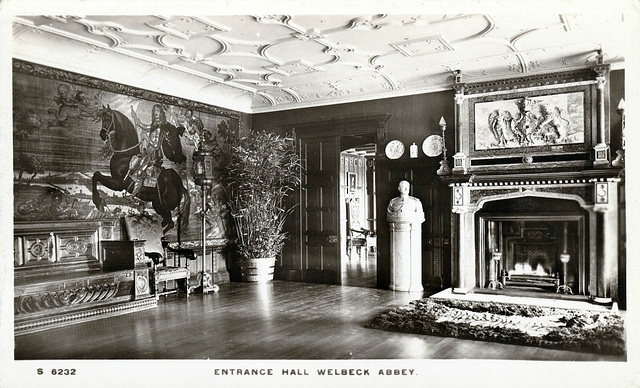 Old postcard of Welbeck Abbey’s Entrance Hall. Instead of the tapestry on the left wall, there are now three horse paintings, a central table and a large rug. A coach took us from the Harley Gallery just off the A-road, onto the estate and the magnificent Edwardian drive, and dropped us off at the front door. Ned was full of anecdotes and interesting facts, making him an engaging and informed guide. His brother was around for anyone who had more detailed questions about the art on display. Obviously the poor chap was bombarded with questions by me. He was forever kind and patient though and let me leaf through the folder which listed the art works on display. We were taken into the beautiful entrance hall, where three enormous horse portraits are on display, from a set of 12 commissioned by William Cavendish 1st Duke of Newcastle, in the early 17th century. William was a courtier and horse lover who wrote one of the leading treatises on dressage, still considered important today. Just like his grandmother Bess of Hardwick he loved building and worked on Welbeck and his little pleasure castle at Bolsover, throughout his life. One of the horse paintings, by an unknown artist, shows Welbeck Abbey in the background as it would have looked in the early 17th century. A lot has changed in the building since then. Onwards we went, into the magnificent Gothic Hall, an 18th century alteration commissioned by one of the many fantastically independent Cavendish women Henrietta Harley (Cavendish-Holles, William’s great granddaughter) who built a truly stunning dining hall in Gothic style in 1751. On the walls we see excellent copies of the famous Daniel Mytens portraits of the Arundels, a portrait by Mytens of William Cavendish and another of his wife. There is also a portrait of Arbella Stuart – a copy of an original that hangs at Hardwick House – once potential heir to the throne and grandchild of Bess of Hardwick, in a beautiful ‘Welbeck’ frame. 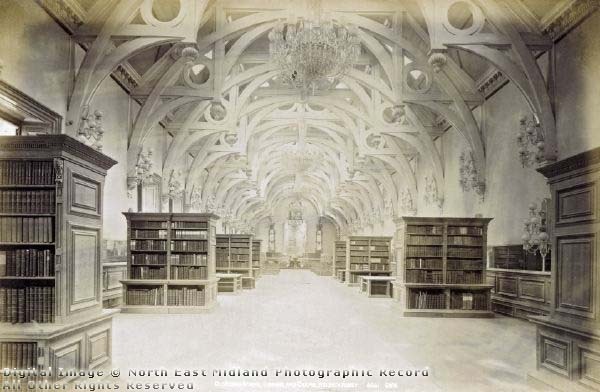 Late 19th century image of the Gothic Hall. The Gothic wall decoration has since been removed but the ceiling remains intact. Photo: Picture the Past website. The tour goes on, we pass a gorgeous portrait of Henrietta by Godfrey Kneller (1714) in a less beautiful and bombastic frame, we admire Arundel’s cabinet: a beautifully decorated cabinet from the 1630s, purchased by the family in 1720. We pass by more rooms filled with tapestries and paintings by great masters or copies of great masters, including a charming child portrait of Henrietta’s only child Margaret by Charles Jervas from 1727. We learn that Philip de Lazlo used to visit Welbeck around the turn of the 19th century and some of his works are here. We leave the main house and walk through the rounded 19th century ‘Pink Corridor’, filled with paintings, which was built over Henrietta’s 18th century drive, towards the library and chapel, which together were once William’s enormous 17th century indoor riding house. In old photographs and drawings we can see that there is a magnificent roof structure, sadly now hidden under a thin plaster ceiling. The riding house is now divided into the chapel and the library but one can just about imagine the magnificent scale it used to have (it measured 36×12 metres). This wonderful roof structure is now covered by a plaster ceiling and invisible. William Cavendish’s Riding House was turned into a library in the 19th century. The roof structure has been added to (the circular decoration and some other extra beams) but the main 17th century design is still there. Photo: Picture the Past website. Engraving (reprinted 1743) by C. Caukercken, after Abraham van Diepenbeeck, from the first Duke of Newcastle’s “A general system of horsemanship in all its branches”. We find a Joshua Reynolds in the chapel, and on the way to the chapel we pass by one of a few early 17th century tapestries (in wonderful condition!) in the mainly empty library. The tapestries (1630s) are from the Antwerp studio of Michel and Philip Wauters, depicting scenes of horses taken from William Cavendish’s dressage book, which included engravings by Abraham van Diepenbeeck. Van Diepenbeeck was a pupil of Rubens and worked in England and The Netherlands. His engravings were used for a series of tapestries, commissioned by William, a few of which we can still see in the house. Since this is a private home, we are not allowed to take photographs inside or outside and we are not shown any of the outside space. The whole experience is like being dropped into some underground rooms (ironically, as the Abbey is famous for its 19th century underground tunnels and rooms, built by the 5th Duke of Portland) where nothing of the outside can penetrate. We walk, blind and unaware of where we are in the house, after our guide and make sure we don’t take a wrong turn for fear of being lost forever in this mysterious place. 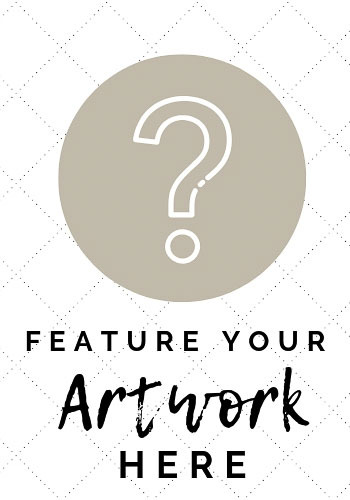 Although it is completely understandable that the family does not allow too many intrusions into their privacy it is intriguing to know there is a treasure trove of art and history waiting to be discovered. No-one ever wrote a monograph on the nearly 900 years of architectural history of Welbeck Abbey, as far as I know, nor on its art collection or its owners. The only exception that I could find is the charming book on William Cavendish by Lucy Worsley but that does mainly focus on the Cavendish’s little pleasure castle down the road, Bolsover Castle, which is open to the public and so much easier to research. 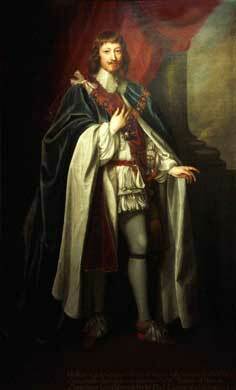 William Cavendish, 1st Duke of Newcastle, After Sir Anthony Van Dyck, 17th century. Image: Harley Gallery. Miniature of Queen Elizabeth I in her Coronation Robes, late 16th century, unknown artist. 89 mm high x 56 mm wide. Image: Harley Gallery. Miniature of 1st Duke of Buckingham, George Villiers, 1640. 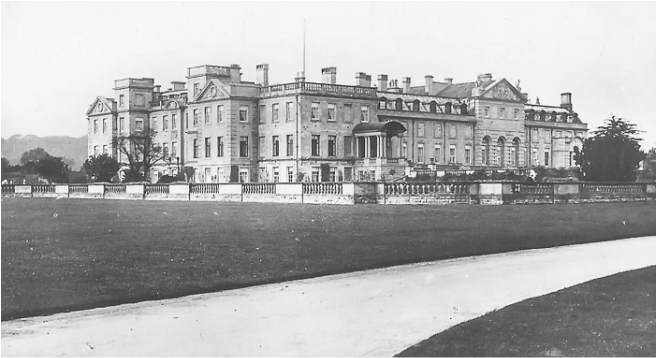 Before and after my visit I have researched Welbeck Abbey a little bit. I have tried to understand who is who and who built, inherited or collected what. I have found very little indeed. Photos of Welbeck Abbey date mostly from the 19th century, indicating that no photographer has been able to gain access or publish his/her material for over a century. Images of the art collection are almost non-existent; I could not illustrate this blog post with Joshua Reynolds’ altar piece from the chapel, for example, as no image is to be found online. 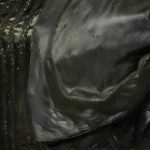 The famous Portland Art Collection has been kept very private indeed and few know exactly what it contains. However, in 1977 the Duchess of Portland founded the Harley Foundation, named after the great collector Edward Harley, husband of afore-mentioned Henrietta Cavendish. The foundation aims to “encourage creativity in all of us” and consists of artists studios, a gallery and a shop. In the past it has shown pieces from the Portland Collection in its gallery space, exhibitions I would have loved to have seen. The archives of the Harley Gallery website still show some details of these exhibitions. 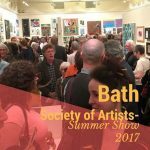 There are also exhibitions of contemporary artists and the gallery is active in organising educational events, craft markets and Open Studios. By now there is also a lovely cafe and a farm shop. The good news is that in the spring of 2016, the doors to the Portland Collection will open wider than ever before. Some of the 11,000-piece collection will go on display in the new Harley Gallery currently being built next to the ‘old’ Gallery. The display will rotate every 3 years and we might finally see the veil of suspense lifted over this, for what I hear, spectacular art collection. 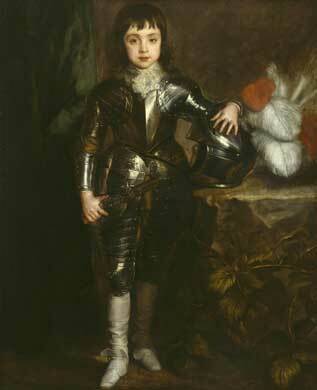 Expect Van Dyck, Hilliard, Holbein, Kneller, Mytens, Stubbs, Sargent, and more. It should be a museum well worth visiting. I hope to write more blog posts on this intriguing place soon. The architectural history of it, as far as I can fit the puzzle pieces together, is worth exploring, as well as the Portland art collection, for what I can find out about it and am allowed to publish. Then there is the wonderful story of William Cavendish, as told by Lucy Worsley in her book Cavalier, not to mention his wives, daughters, granddaughters and grandmother. 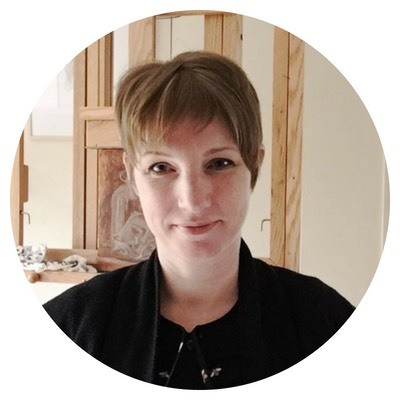 Many of the women in the Cavendish family are independent, intelligent ladies with a mind of their own (William’s second wife was the (in)famous Margaret, writer and scientist in a man’s world). (more on the Cavendish family can be found here). The ‘tunnelling Duke’ 5th Duke of Portland is an interesting man as he was the one responsible for building an underground ballroom, miles of underground tunnels, including railtrack, and another enormous riding house. I don’t know if I will get round to writing about all of this, as I am also busy working on a commission for Harley Gallery (more about that later) but it might just give you an idea of the cultural treasure that is Welbeck Abbey. 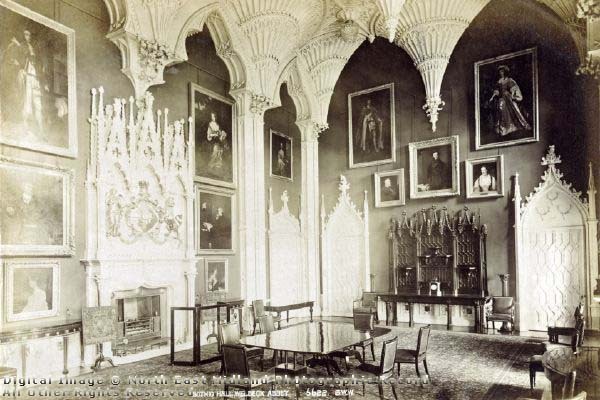 I know that there are no recent photos of Welbeck Abbey interiors on the internet but when it was Welbeck College we (the students) took thousands of photos which must be out there somewhere. Unfortunately mine have gone missing over the years but there must be Old Welbexians out there who still have theirs. I would absolutely love to see them.